Why so Few Craft-persons? What Metal is Best? Why a Metal Roof Cap? 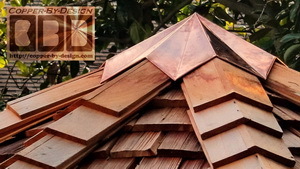 Besides the benefit of this being the crowning jewel of a classic Victorian style house or a cute gazebo; when roofing a structure like this where the roof comes to a peak with a 4, 6, 8, 12, or 16 sides it is always a problem for even the most professional Roofer to figure out what to do at this peak to bring the roofing shingles together; making it look right and seal the peak from rain. Below is some of the best roofing work I've seen, yet you can see where rain water would still work it's way in at the top. Asphalt shingles are easier to work with, but harder to work them into the center, where you could have 8 layers of shingles overlapping on just a 4 sided roof. How many layers is that on a typical 8 sided gazebo roof then? This is where a custom sheet metal roof caps comes in. Even if the Roofer caulked these seams at the top it would only last a few years, and need to be cleaned and re-caulk before it begins to fail, causing damage inside, and it is near impossible to get caulk to stick to an aged roof. Also, this is a popular place for birds to roost (and poop). 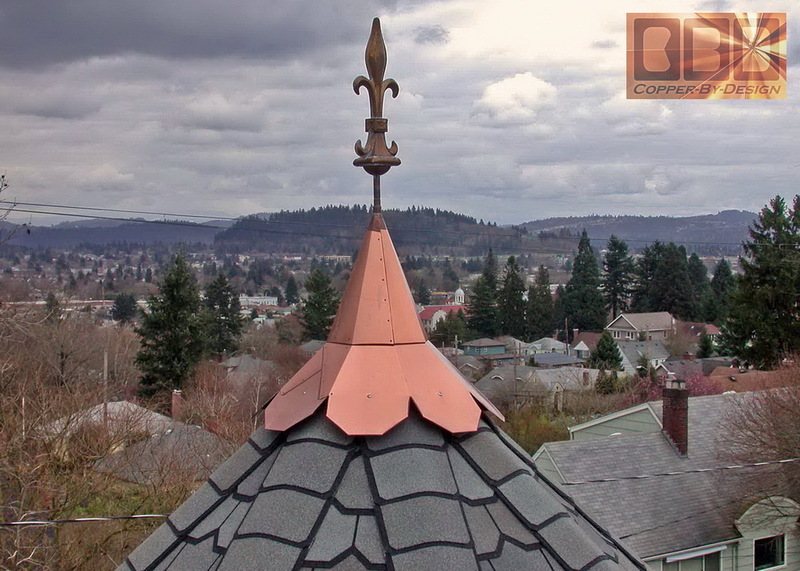 For these issues a steeper copper roof cap has proven to be the best lasting solution to top these sort of structures, and add a nice decorative finishing touch. Another very important issue, which is largely overlooked for these types of roofs is venting. For some reason venting is rarely implemented into these types of roof structures, but is still a very important detail that needs addressed. Our copper roof caps can be used to cover a vent hole here at the peak. We offer support blocks and screen kit to keep out pests and give the roof cap a more solid base to mount onto, which raises it up off the shingles. You can read more about this on our Roof Venting web page and how we combat this issue. Even if you are not considering a roof vent if it is not too late in the construction process this hollow core center piece is what should always be used in every turret or gazebo roof framing to attach the roof joists onto in the middle. For some reason very few framers know about this or have realized it's advantage this would have. Even if they have already built the roof this can still be implemented, but not nearly as easy to install at that point. They will give you a fair amount of grief if you try to push for this, but I implore you as the Homeowner to insist on it! This has nothing to do with me trying to sell you anything here. It can be easily made with a common 2X6 or 2X8 board trimmed at a common 22.5 degree angle on the edges and assembled as such, and glued together. They can hold it in place with staples until the glue sets. Simple as that. It confounds me why this is not the standard, yet it is extremely rare to see. 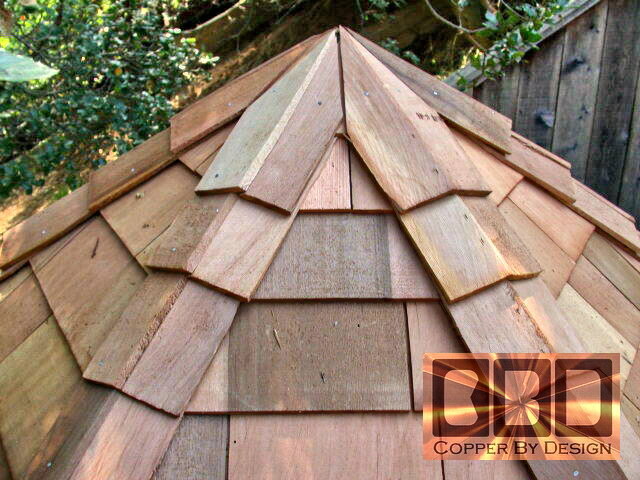 Additionally, a copper roof peak cap will help to retard the growth of moss and mildew on the shingles below, just like zinc does. A zinc plated steel cap may be cheaper, but the zinc coating will dissolve off within 10 to 15 years. Then the rusty steel will permanently stain the roofing below, so copper is clearly the best metal to use and not have to worry about it again. We supply the stainless steel sealing screws to fasten these down with as well, so the copper roof cap can be gently removed and reused when re-roofing is required, so this cap should be just a one-time purchase if built well. For custom work like this and freight, the cost of the metal used is only a small fraction of the cost, so using a cheaper metal would only save about 10%. It seems silly to use anything less than a good thick copper, so the cap will stand up to a century of the elements and several re-roofings. 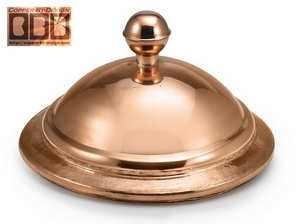 Copper will last 5 to 10 times longer than a steel cap, so copper is by far the best value in the long run. Note: We do not intend to be misleading with prices listed on these web pages for roof caps made prior to to 2006, but as you may know metal and fuel prices had doubled that year, so we have had to compensate. So keep in mind how the prices listed may not reflect the current cost accurately. They are here as a guide to see what these cost at that time. You can go to our Latest News web page to read more on this subject. This is a small 18" wide round seamless copper dome cover, which was designed for decorative garden hose pots can be used for a cute roof peak cap. I discovered this can work well used to seal the peak of a gazebo or turret roof between a 4/12 pitch to a 10/12 angled roof. When ordering list how many sides your roof has, so we can punch the screw holes for you in the right places and supply enough SS screws w/sealing washers for attachment. The cost for this w/freight is just $150 each. For this price I am offering these cute finials w/high grade 316 stainless steel sealing screws, box, packing, and freight within the continental USA while supplies last (just 64 left). They are even less than our $200 minimum charge for any custom work we do. With these being ready to ship there's also much less wait time as well. I think this looks pretty good for the money! What do you think? It is a little hard to get a good picture because of the angles and reflection. Your work on your website is so beautiful. I hope we get a chance to have something made by you sometime. We lived in Portland for a year and really loved it there. Why are there so few custom fabricators around these days? With our current automated mass-production with slave labor in China, India, and other parts of the world we are use to paying far less for most items we commonly buy. Sheet metal stamping machines are very expensive, but if they can produce a million of the same units swiftly that cost is dispersed down to pennies per item. There is no way small custom fabricator shops like mine could begin to compete with products like those. 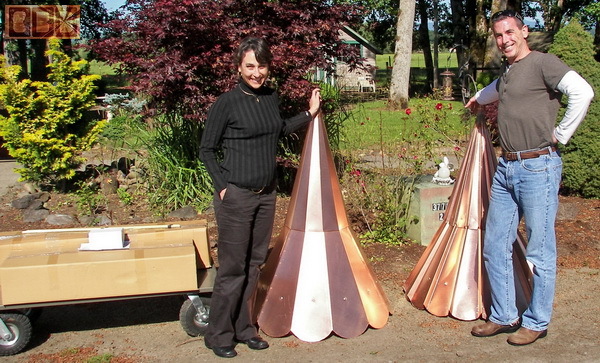 That's one reason I sell decorative weathervanes and finials from Good Directions, Inc.. It would cost 3 to 4 times as much to have me make what they have mass-produce, and it probably wouldn't even look as nice being hammered by hand. 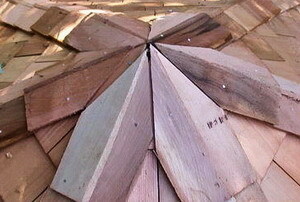 The issue you face here with ordering a roof cap is how most all of these roof caps need to be custom made to order, because each roof is so different. I have yet to see an outlet for generic roof caps. 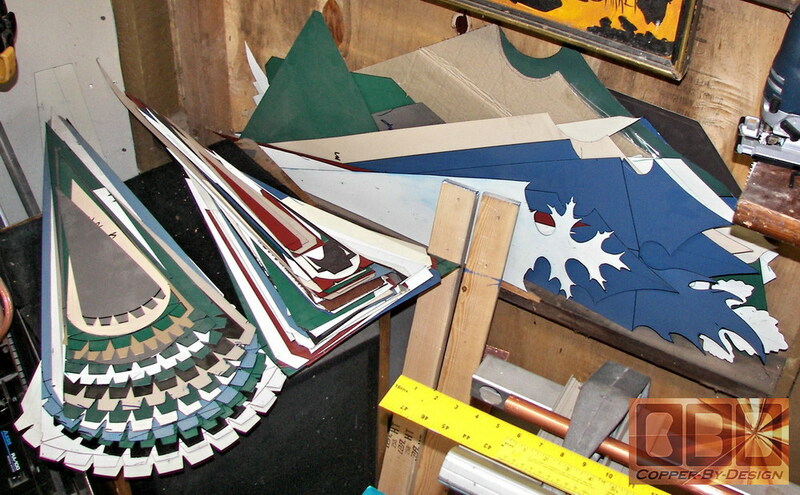 It is rare I have been able to reuse a roof cap template twice (shown here). These seem to be so unique, they cannot be just mass-produced and set on the shelf waiting to be ordered. There are too many variable between roof pitch, # of sides, size, options, and style. 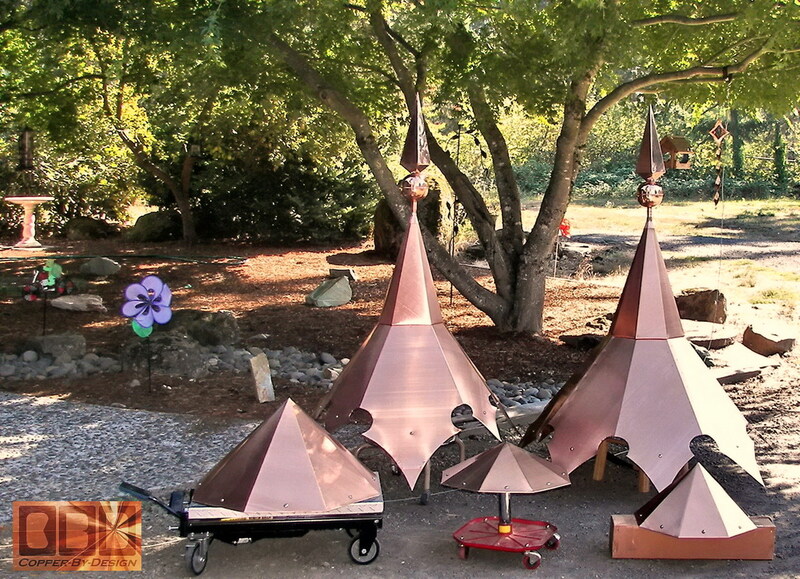 I don't stock even 1 popular roof cap design, as I have not found a single size and shape that is that commonly ordered. The scallop tails seem to be the most popular, but the width is always different. 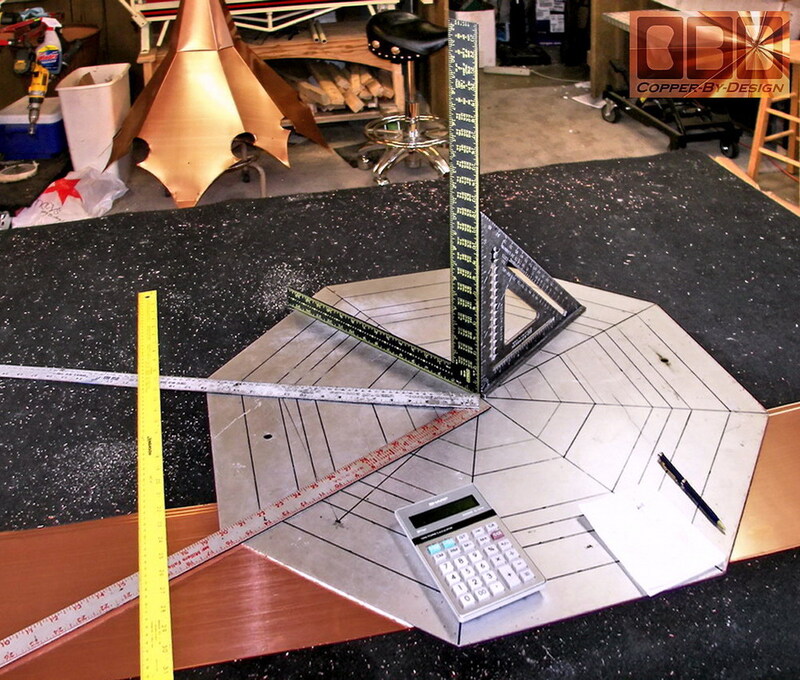 Also, there seems to be very few talented sheet-metal fabricators who are promoting their work on the web, but there must be a lot more out there. Those who are willing to take the time to correspond through e-mail with photos and diagrams for small orders like this is also a rare thing to find. Then a shop willing to properly crate it up and ship it off to you. It is common for us to trade a dozen or so e-mails to work out all these details with potential Clients. It takes a good deal of swift attention and investment, but few are willing to put in that much effort on such a small project. Looking for a skilled Coppersmith locally in the phone book would be taking a stab in the dark, since you cannot see what they have done or get referrals. Even if you can find a local shop willing to do this, you may feel rushed to make a quick decision, and not given time to go over different options and costs. To do quality lasting custom work like this requires good geometry skills, artistic imagination, and a high mechanical comprehension. Some decent ethics would be nice as well, but that seems to be a rarity in our modern society. Greed and sheer laziness is one thing, but when they intentionally cheat their clients with planned obsolescence, that is inexcusable. Any product is only as good as it's weakest link. To work this all out across these wires takes prompt discipline and good communication skills that very few people seem to have in any industry. Diagrams and digital photos have to be passed in order to work out crucial details, so this will work out just right w/o complications. Fortunately most people now own a digital camera and have learned how to share photos through e-mail. Especially since in most cases I am not able to take measurements myself with most of our Clients living over towards the East Coast. I have to rely on my clients to get all the accurate information I need. I need to know the right questions to ask. Some times to the point of annoyance, since I actually care how these turns out. Sadly few are willing to invest this kind of personal time and effort to ask the right questions. for our client Mr. Bergstrom. See below for a close-up shot of these crappy roof caps. 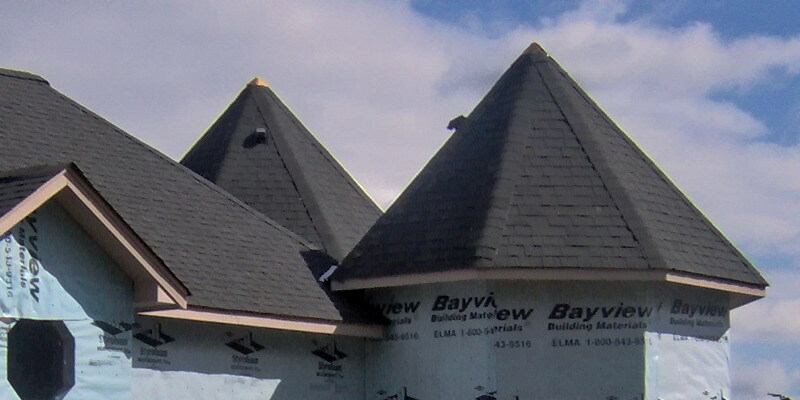 The pair of turret roofs shown above were covered by the roofer with a pair tiny 12" wide roof caps that we replaced on a new house still in construction (9-7-05). 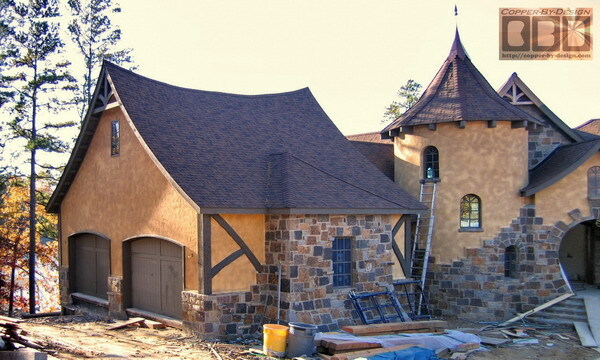 They were made by the professional roofing contractor to cover each of the two turrets they were hired to roof. 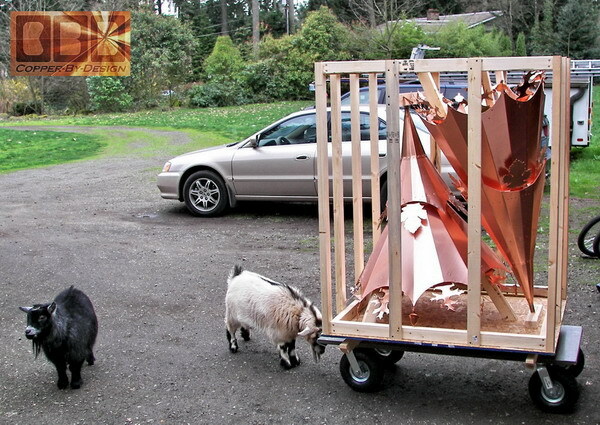 Besides their very poor fabrication (it is the worst example I have ever seen), it was just a cheap piece of steel sheet metal that was bought pre-painted to resemble untarnished copper in order to fool the Homeowner into thinking it was actually copper (which it did). 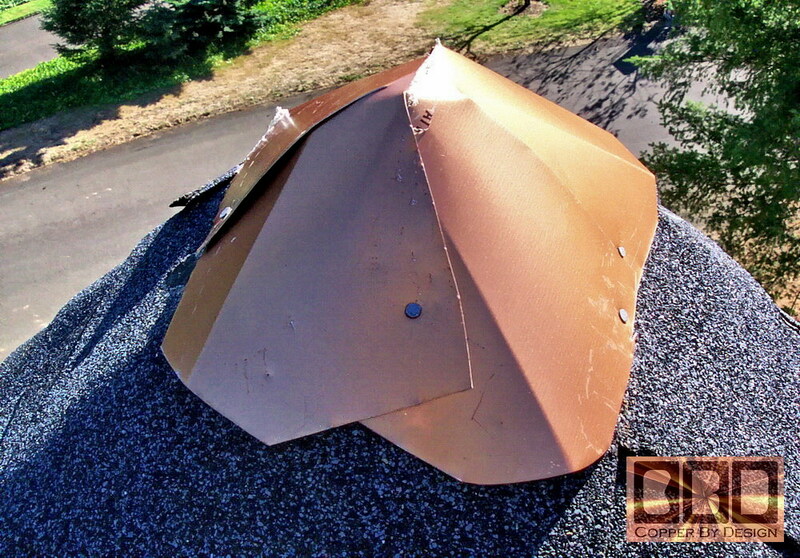 The roofer saved only $3 on each turret roof cap with this cheap imitation in stead of using actual copper. 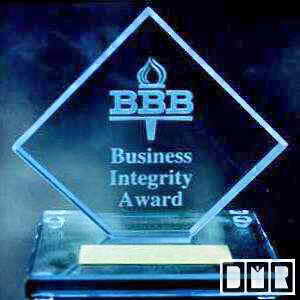 That was a grand total of a mere $6 savings to inspire that roofing contractor to deceive their client and risk getting caught in this fraud. Intentional fraud for only the cost of a good burger? Amazing! Worse yet is how he did such a poor job of it. Instead of simply cutting out a circle then making one cut to the center to simply overlap the seam to form a cone shape and caulk that one seam, as you can see here they made these 4 crude cuts to the middle and nailed this to the peak of the turrets. As to the exposed nails you can clearly see here; the whole concept around any roofing material is to have all the fasteners (nails) hidden. This goes against that concept entirely. Any exposed fastener should be no less than a stainless steel screw, so it cannot rust while holding tight pressure. Also, there was not even any caulk used to seal those 4 overlapping seams. After my 2 decades in exterior construction work, this was the most pathetic attempts to seal a roof peak than I could have imagined. The reason roofing contractors will short cut these sort of details are because the State's Construction Contractors Board only requires licensed contractors to complaint within the first year of their work. These cheap products will skate them past that brief deadline in most cases. Even if this did not even last through that first year, they know how most Homeowners will never find the strength or means to pursue this issue for resolution after their attempts for resolution go ignored by the contractor. Most clients simply loose confidence in that contractor and seek out a different contractor to fix the problem, in hopes they are not going to get taken yet again. I heard several recent cases where a Homeowner complained to their contractor about poor workmanship, and were threatened with bodily harm if they didn't drop it! 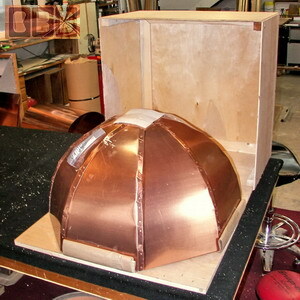 Above is a look at the new larger 'copper' roof caps I made in a small 1/8 scale proportion to the turret roof size. What do our roof caps cost? New roof cap orders will be priced reflecting the current cost of materials and shipping with the costs of copper and fuel having doubled since early 2006. Our prices had not doubled, but they have needed to go up a bit to accommodate these changes. We have hundreds of examples here with the price listed that the client had paid at that time to help give you an idea of what a roof cap in the size, style, and roof angle that you need would run you. Instead of playing that sort of pricing games with you for roof cap projects under $2k I price quotes with all the installation hardware and shipping expenses included. That way there are no deception or hidden charges to consider. 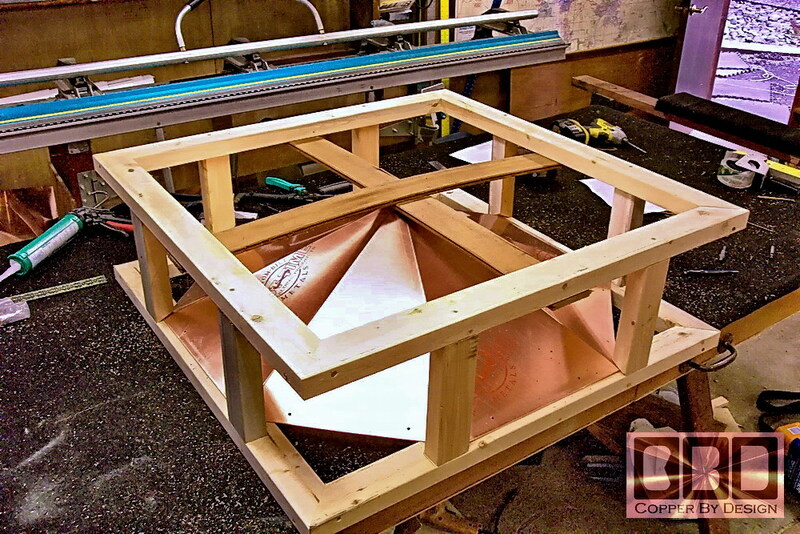 This includes a custom wood frame crate, and ground shipping within the continental USA. Our custom roof caps start at a $200 minimum charge including shipping, but if you are able to come here to pick it up I'll wave our minimum charge. 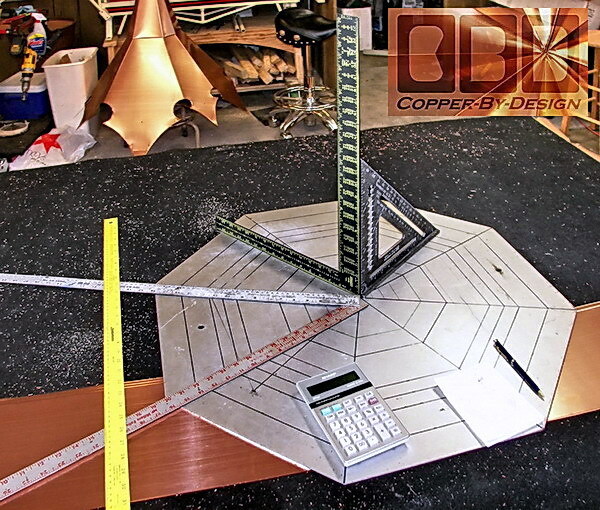 The cost is calculated on how much copper it takes to build them, based on weight of the final product divided by 1.25 to get the calculation of the square footage left in the roof cap once complete. This way there are no charges for loose estimates or the cut-off waste to build it at that quoted rate per square foot. 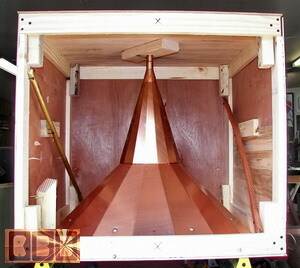 Our $200 minimum charge will get you about 5 square feet of the 20oz copper I use. We need full payment for orders under $500, but only require a 1/2 down deposit on orders over $500, and just a 1/3 deposit on orders over $2k. Along with the wood frame crate and shipping cost the roof caps I make normally run $50 per square foot depending on size and complexity. 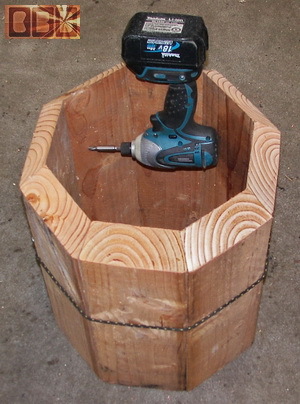 For a simple small caps that can fit in a 21" cubed box can cost as little as $40 per square foot. Simple roof flashing can run as little as $12 sq' plus shipping for a thinner 16oz copper. That is probably the best price you will find anywhere for custom work like this. From what we have heard from our clients I may be the only custom shop to offer what we do at any cost. Other shops will not give you options that we consider standard, like the way we build stronger finial/weathervane support systems into our caps. There is a high chance they would make their products with the standard 16oz or even 12oz copper. How would you know for sure, and how difficult would it be to prove and fight this fraud after you received the item(s). Because of this Internet exposure you see here most of my clients are not even located in Oregon, so this is a moot point for them, but I am a licensed Contractor here in Oregon and when ever possible I would love to come out to your house to get all the measurements and angles needed, and then install it to know it was done right . Although, even for local clients I am not insured to do roofing related work, because that 1 type of insurance is over 500% higher than any other type of construction work. I did carry that type of insurance for a few years, but I am just not able to do the volume of work needed to be able to afford that kind of insurance. Sorry. I work hard to design these roof caps to be strong, easy to install, and re-install when re-roofing, as well as to easily change out the center decoration, but I understand how dangerous it is accessing the peak of a steep roof. If you are not able to install it yourself, you will need to hire a local contractor to do the roof cap installation. You can try some Consumer Protection web sites like A's List and Insider Pages to find a local installer in your area that has positive reviews from other Homeowners. I also personalize it through e-mail with each order at the time it ships. There is info on the lightning rod issue on that page. 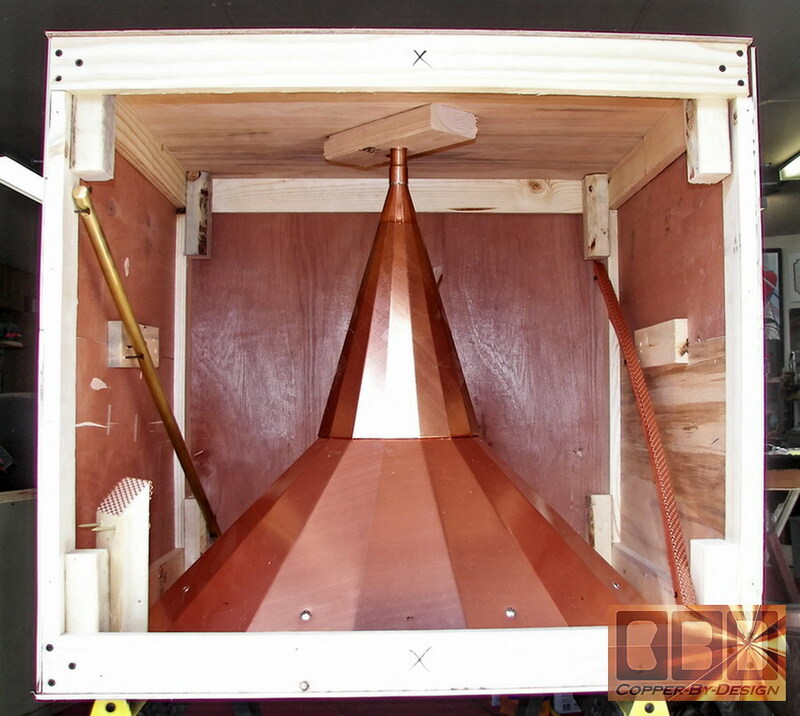 Over the last few years I have been successfully shipping custom copper work in custom wood frame crates to clients from all corners of the continental USA through FedEx Ground or Roadrunner Transportation trucking service for larger crates. I have shipped to Canada and the Caribbean, but the shipping costs and import taxes were alarmingly high; where it may cost more for the shipping than the unit it's self. Throughout the fabrication process before shipping I send you digital photos of the progress I've made through e-mail for your review and approval. I welcome your feedback. 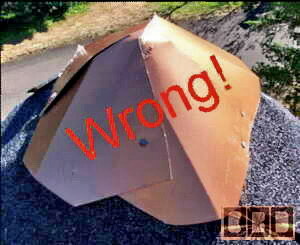 I also provide the rust-free hardware and fasteners to install the new roof cap. You will see here that I have decided to name the roof cap styles after the clients who ordered them, instead of giving them a number or some silly name. This has been truly a collaborative effort, so that has made a lot more sense. It has been pretty fun to see our new clients refer to a cap style or combination of styles they want a quote for by the names of our former clients. 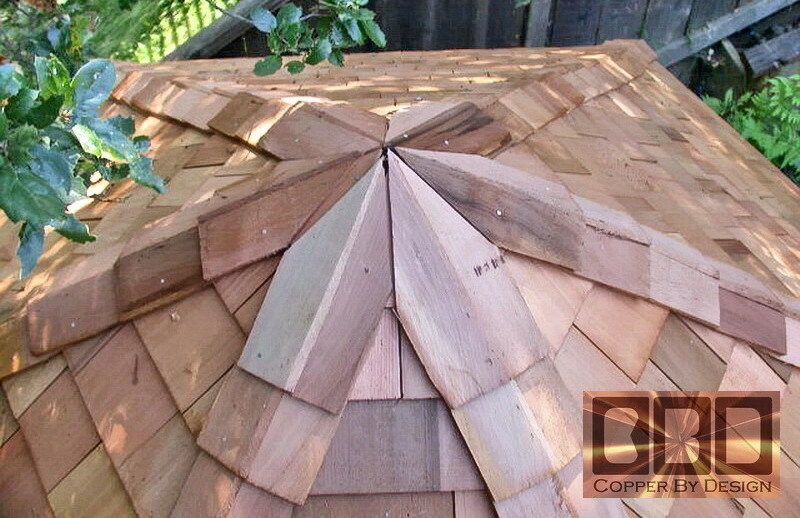 If you are concerned about sealing the roof peak until the new roof cap arrives just go ahead and have the roof shingled up near the top where the shingles begin to converge. 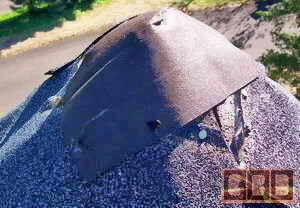 Then use some of the left over roofing felt paper cut in a large circle to cover this peak. 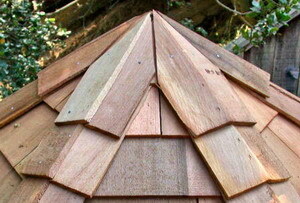 This can be cut in to the center to be able to overlap that seam to form a cone that matches your roof angle. Tape the fold together and tack it in place on the roof peak. 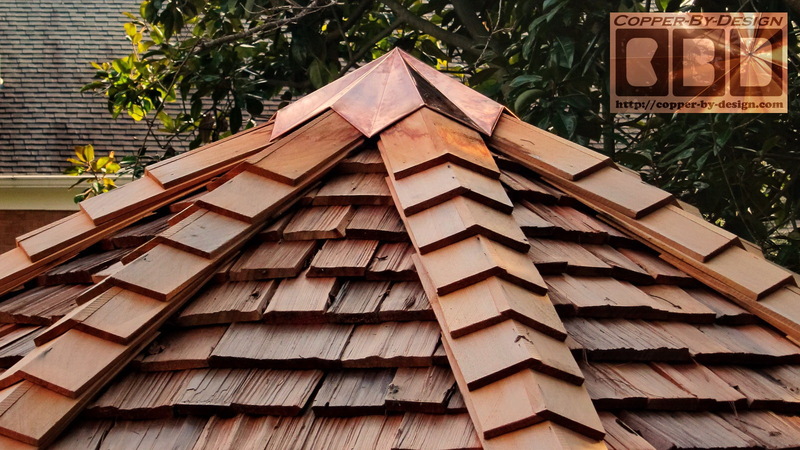 Without even cutting the roofing felt you could fold and overlap one side up to the center point to form into this cone shape, so it is seamless. Here is a photo of a sloppy cover done with just a tiny piece of thin roofing felt by a Roofer in Washington, to give you an idea of how easy this is. 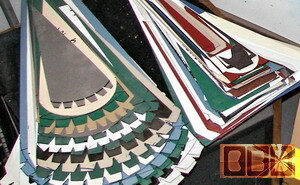 I recommend using no less than 30# roofing felt for any roofing work, where 15# felt is the standard. That would add about $10 to the cost of covering a large turret or gazebo roof and well worth it. This makes a decent temporary cap that covers the tip and overlaps the last roofing shingles up there. 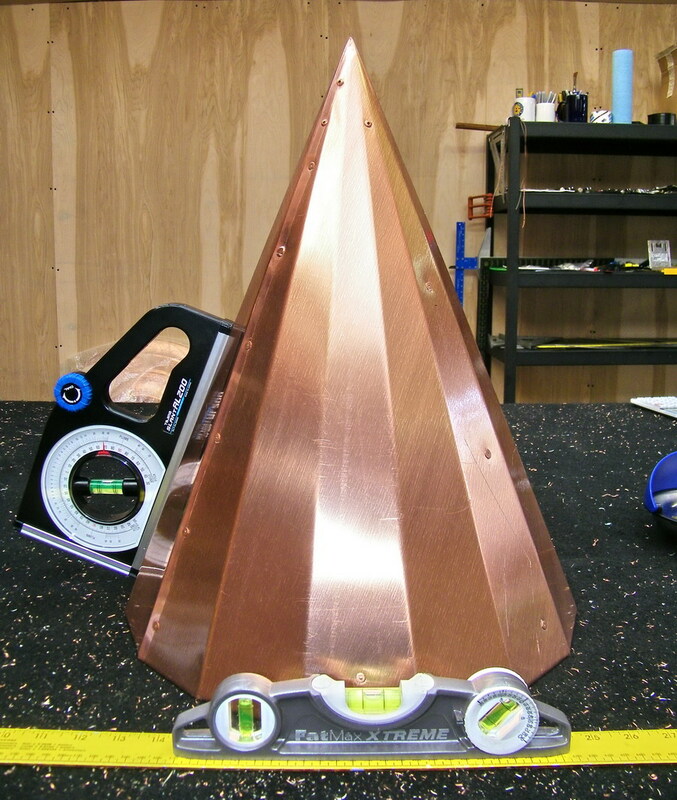 This can also help give you a better idea of what the best size for the copper cap should be and how it would look up there. This will be a reliable cover for at least 6 months, and relieves any pressure to make a hasty decision of what sort of roof cap or other decoration options you want to consider and whom to do business with. 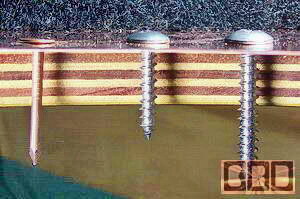 This photo shows examples fasteners used for installing. We do not supply copper nails unless requested. I highly recommend the stainless steel screws on the far right instead. There's no cost difference to you. Nails: on the left is an 1.5" to 2" solid copper roofing nail. I also have small head bronze nails with ribbed shaft for a better hold, but nails are rarely used, because they cannot hold steady pressure like a screw, but more importantly is removal decades later when the roofing shingles have to be replaced. Nails are only upon request. Stainless Steel Screws: I've not yet found a source for copper or bronze screws, so these will have to suffice. These screws are high grade non-magnetic stainless steel with a larger #3 Phillips slot. I use to have some screws with a #2 slot (as seen in the center), but I do not stock those any more. These screws have a strong #14 shaft that comes in 1.5" to 2.5" threaded shaft with a wide dome shaped carriage head. New screw tip included. The larger #3 slot is a lot less likely to strip out during installation. 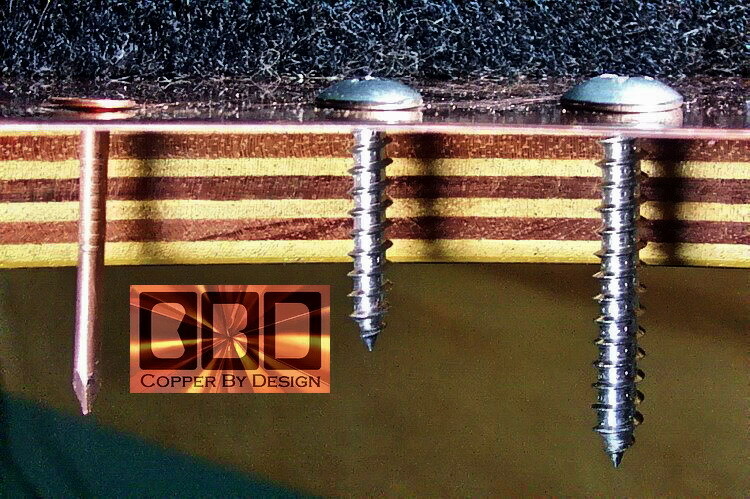 Besides the initial installation; these screws allow the copper roof cap to be removed without damage and reused decades later when the roofing under it needs any sort of service or replacement. This make it a one time purchase that can be reused for many decades. Much like you, I do not place much stock in long term warranties and refuse to play that sort of BS game. I've seen claims on the web of a 100 year warranty on copper gutter work, but that in it's self is an insult to our intelligence and a clear lie. No small or even large company can honestly make such a claim. That sort of claim would have to be false, since any company has less than a 1% chance to be around that long. That is unless science comes up with the cure for aging and they adopt ethical responsibility. Most small companies do not last more than a few years, so it is easy for them to make such outrageous claims like this. I feel it is ridiculous to offer more than a realistic warranty, since you know we will not be around to service such a warranty. I offer a more realistic 20 year fabrication and material warranty, which cannot cover damage from an impact. 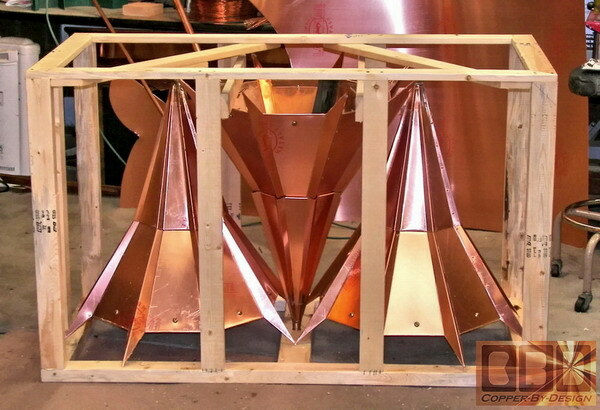 If Copper By Design is still selling products after that time we will likely be happy to warranty and service your needs beyond that time period. Perhaps my Son or Daughters will want to continue the business, but I have no way to force them. I, David am 47 (as of 1/30/10). I pride myself on being honest and not make unrealistic claims. More importantly, I go out of my way to build products that far exceed building code. I challenge anyone to find work as strong and well constructed as these, anywhere. An example is how you are not likely to find another fabricator who puts this much care and quality into their web site, let alone their products at any cost. We feel that good clear communication is very important. It is like the saying 'If you aren't able to do it right the first time, how will you have time or money to do it over?' 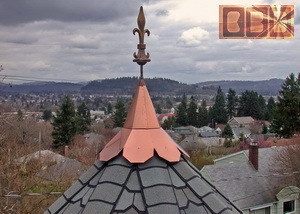 We have professionally specialized in rain management sheet metal work since 1993 under the same contractors license here in Oregon, and plan to continue this for the next couple decades if possible. We usually pay extra for the insurance FedEx offers for the items we ship, but it would still be a huge hassle for you to deal with all that paperwork in case of a damaged unit in transit, as well as lost time. That is why I put so much into the wood frame crates I custom make for each item. You will not find a better constructed wood frame crate as I build with predrilled holes, glued, and screwed together with an outer wood shell that are fairly easy to open. This way you are much less likely to need to deal with that sort of time delay and hassle. So far (as of 3-20-10) we have only had 3 items damaged in transit. The first 2 crates were clearly marked with a 'TOP' side designation, but were apparently dropped upside down off a forklift or something. We stopped using DHL over the first issue. 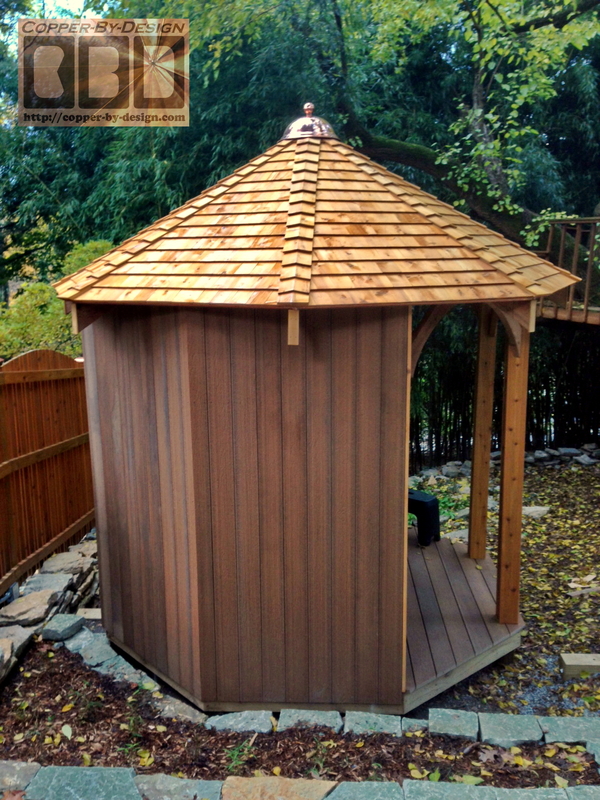 We rebuilt that project even stronger than before: a crown style chimney cap and shipped it back to her at no charge. The latest was punctured by the tongs of a forklift. I'm not sure what would need to be done to prevent that sort of carless abuse. We have worked to make improvements in our packaging since then to anticipate these sort of accidental rough handling, because we sympathize with our clients over the huge delay it would cost to have the item sent back to us for repair or replacement. We have been told several times that we build the strongest shipping crates that our shippers or clients have seen. 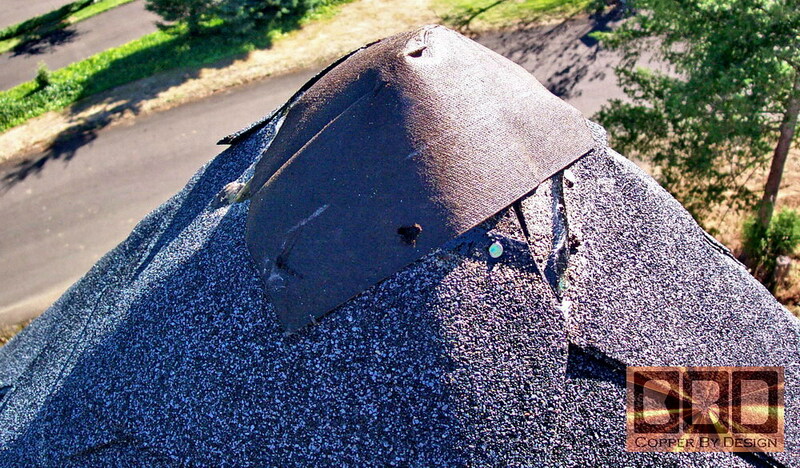 Since we are not the installer of your new roof cap, we cannot warranty the installation of course, or damage that could occur after it had arrived. I do my best to supply personalized detailed installation instructions and recommendations of what tools should be used. We also send the stainless steel screws with each order, so the right fasteners are used. That way decades later when the roofing needs replaced, the roof cap can be safely removed and reused over and over again. We have yet to hear of a client who was not able to get their roof cap installed without damage. I cannot guarantee your project will be flawless. I will guarantee it will fit the specification you provided and will be built as well as I know how, given the limitations of your budget. In the case of an issue arising from the client being unsatisfied with a project before it ships; I will normally bend over backwards to make things right. Fortunately this has only been a problem with one client (2/08) where we were not able to resolve our differences, so it could happen. I cannot possibly cover all possible issues here, but if a clients aesthetic concerns conflicts with design quality; I will not compromise my standards, even if that client is fine that it would void the warranty. Any project can be canceled at any time. I am not looking to hold a client to a contract. All but $100 is refundable before I have started physically building your project. 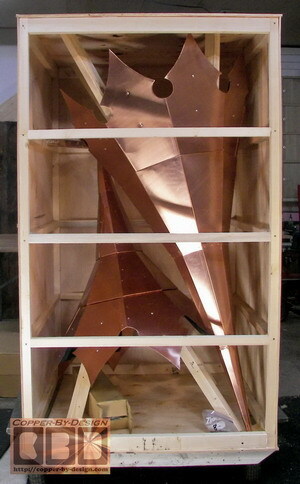 The deposit paid will not be refunded after I have begun cutting and bending metal for your project.